For Disney fans all over the world, Fantasyland is the heart and soul of all Disney parks, originally debuting at Disneyland in Anaheim, California, in 1955 and later in the Magic Kingdom at Walt Disney World in Orlando, Florida, in 1971. Arguably the most beloved of all themed lands, Fantasyland always boasts a fairytale castle and gentle kiddie rides themed after Disney movies aimed at young children, including Dumbo the Flying Elephant and Mad Tea Party. In 2012, Disney opened a dramatically larger, revamped Fantasyland at Walt Disney World in Florida as part of the largest expansion in the park’s 41-year history. The size of Fantasyland doubled from 10 to 21 acres, making room for an elaborate new "Beauty and the Beast"-themed restaurant called Be Our Guest, which is housed in an intricately detailed mock Beast's Castle. The new Fantasyland also doubled the capacity of Dumbo the Flying Elephant and added two new rides, Under the Sea-Journey of the Little Mermaid and The Seven Dwarfs Mine Train. Based on Disney's classic film "Snow White and the Seven Dwarfs," this dark ride has been in operation at Disneyland since its opening day in 1955. The present version of the attraction was revamped and reopened in 1983. Other versions of this ride exist at Disney parks in Paris and Tokyo. One of Disneyland's most iconic attractions, the Matterhorn Bobsleds coaster opened in 1959. Located on the border between Tomorrowland and Fantasyland, the ride is themed on the Matterhorn, one of the highest mountains in the Alps, located at the border between Switzerland and Italy. It was the first tubular steel roller coaster and set the standard for modern-day coaster design. 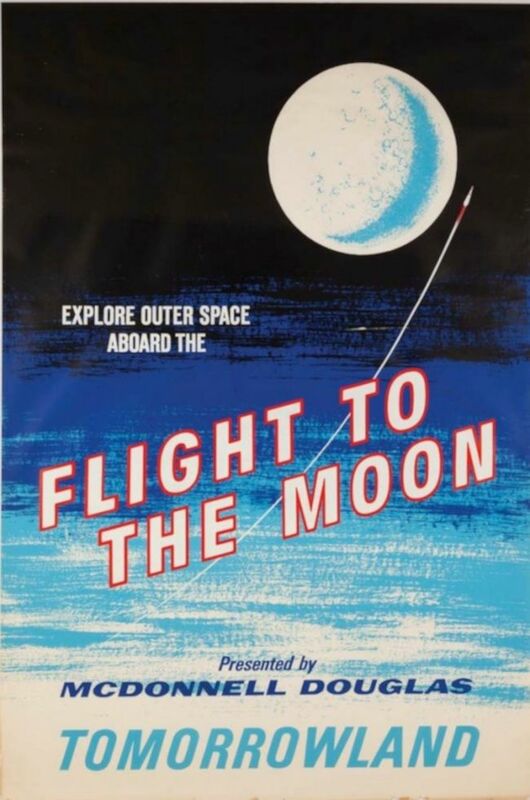 Perhaps the coolest thing about this poster is that the attraction is no longer around. Submarine Voyage opened at Disneyland in 1959 and closed nearly four decades later in 1998. Eventually, the attraction was re-themed and reopened in 2007 as Finding Nemo Submarine Voyage. Blessed (or cursed) with the earworm you just can't shake, It's a Small World is a dark cruise ride located in the Fantasyland area at every Disney park in the world. 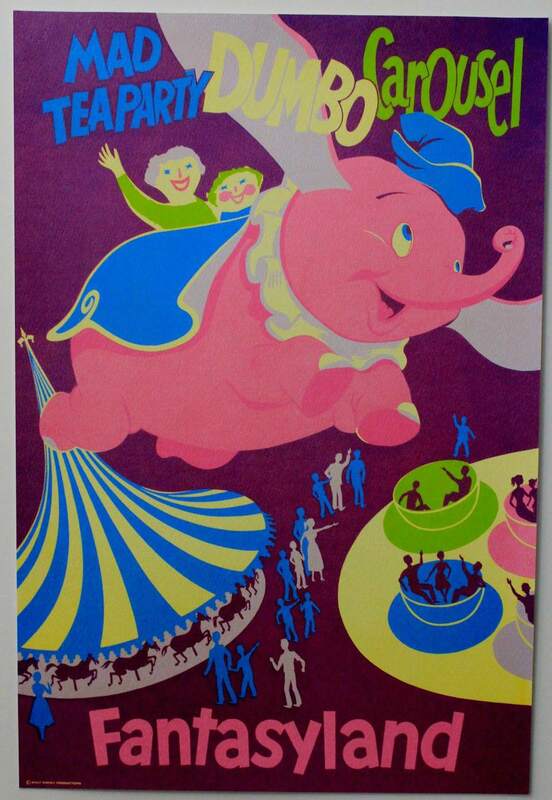 Themed on multi-cultural harmony, the original version debuted at the 1964 New York World’s Fair before being introduced at Disneyland in 1966. Long before Johnny Depp portrayed Captain Jack Sparrow on the silver screen, Disneyland had debuted the original version of this popular dark ride in 1967. It was the last attraction overseen personally by Walt Disney, who died three months before it opened. In 2006 Disney began incorporating characters from the "Pirates of the Caribbean" film series into the attractions at Disneyland, Disney World, and international Disney parks. While the seed for a haunted-house attraction began in the 1950s, it wasn't until after Walt Disney's death that Disneyland finally introduced the Haunted Mansion to the public in 1969. Versions of this attraction also exist at Disney World in Florida and other Disney parks around the world. Open since 1971, Disney World's Monorail system is a public transit system that now runs between several Disney resorts and the Magic Kingdom and Epcot theme parks. Disneyland has its own Monorail, which has been in operation since 1959. Since the first Space Mountain indoor roller coaster opened in 1975 at Disney World, other versions of the attraction have been introduced at Disneyland and at the other Disney parks around the world. Since its debut at Disneyland in 1979, Big Thunder Mountain Railroad runaway mine train coaster has also become a fan favorite at Disney parks in Orlando, Paris, and Tokyo. Poster Art of the Disney Parks, by Daniel Handke and Vanessa Hunt, tells the backstories of the best Disney posters from every decade and is a wonderful addition to the Disney fan's coffee table.